Ageing research calls for a focus on the mechanisms that can explain effects of ageing beyond the purely chronologic marker of age. To address this issue, the present study focuses on subjective age as a holistic construct that is related to various developmental and motivational processes and allows deeper insights into the interindividual variability of the ageing experience in older workers. Specifically, the current study examines on a sample of N = 485 late career employees (mean age 54 years),if subjective age is related to job crafting behaviours of older workers and whether job crafting is related to higher levels of work meaningfulness in late career. Results indicate that subjective age is significantly negatively related to job crafting behaviour over and above the effect of chronological age, self-rated health and workplace autonomy. Job crafting, in turn, significantly predicted work meaningfulness, above the effect of workplace autonomy. In sum, our study provides evidence for the utility of psychological representations of ageing to understand job crafting at work for an increasingly important segment of the working population. Recent research on calling has pointed to the important distinction between having and living a calling in order to explain the positive effects of callings on well-being. However, how the link between having a calling and living a calling might be explained has only been partially addressed. In the present study, we focused on the neglected role of workplace characteristics as key factors in this regard. 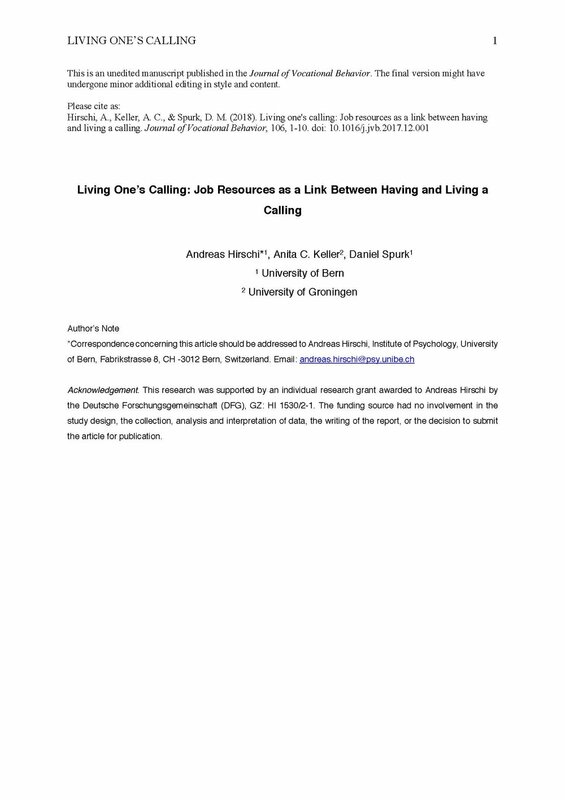 In a sample of 232 working adults in Germany, we established that presence of calling and living a calling were significantly related to job resources in terms of decision-making autonomy, task significance, and social support at work. Moreover, presence of calling and living a calling positively related to level of education, leadership position, and salary. Testing indirect effects with bootstrapping analyses, we found that job resources, specifically decision-making autonomy and task significance, partially mediated the relation of presence of calling with living a calling, while controlling for educational level and leadership position. The results support the idea that living a calling is not just about finding work that fits one’s calling. People who have a calling are also more likely to live their calling by working in jobs with more job resources.